All Hotel Accommodation Voucher winners will be contacted by the FlyerBonus team shortly with further information concerning the prize collection. We wish you a pleasant stay! The Accommodation voucher winners from the FlyerBonus-Citi Rewards promotion will be notified by email at the address listed in the Member's FlyerBonus Profile within 45 Days after the promotion period. The email will seek confirmation of prize received and payment of any applicable Withholding Tax. Winners accepting awards valued at more than THB1,000 are required to pay withholding tax (5% of the prize value) in accordance with Revenue Department Order Number TORPOR 4/2528 dated September 26, 1985 and TORPOR 104/2544 dated September 15, 2001. If a winner does not confirm acceptance of the prize, by paying the withholding tax within 20 days post-announcement, they will automatically forfeit their right to claim the prize. If a prize is not claimed within 20 days, the company reserves the right to withdraw all prize entitlements and award the prize to the next applicable reserve winner with no liability. If the reserve winner does not claim the prize, the company reserves the right to withdraw the prize. Members will be contacted by our FlyerBonus staff, to explain the details and confirmation of the prize received. Accommodation voucher winners must present proof of withholding tax payment, their Government-issued picture ID along with a copy and the Winner Notification email through FlyerBonus member service email, flyerbonus@bangkokair.com in order to receive their prize. 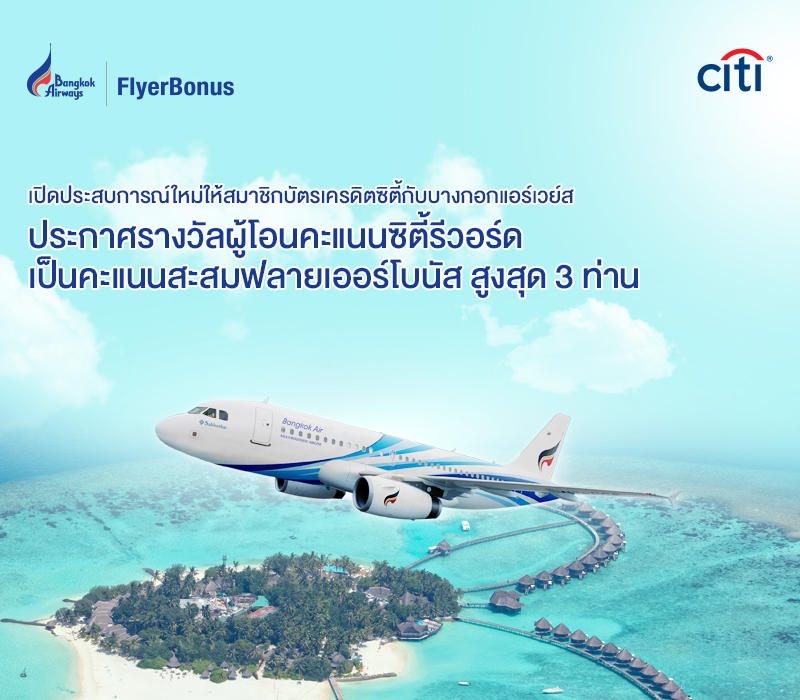 Bangkok Airways shall not be responsible for any consequences that the accommodation vouchers winners are unable to travel on the designated date, the company reserves the right to withdraw the prize entitlements. FlyerBonus will send the accommodation vouchers by registered mail to the Top Redeemers according to the member's provided address with FlyerBonus. Bangkok Airways assumes no responsibility/liability for compensation, refunds or replacement if the voucher is damaged, lost, stolen, or any applicable reason. The voucher shall be deemed void if there is any change or an attempt to change all or any terms and conditions or information stated on the voucher. Advance reservation for room is strictly required and subject to availability. Utilising a voucher is subject to the Terms and Conditions of the awarded accommodations. Bangkok Airways reserves its absolute right at any time to add, alter, modify, change or vary any or all of the terms and conditions stated herein, as well as, remove disqualified/unqualified participant from the promotion without prior notice. Bangkok Airways shall not be responsible for any consequences either direct or indirect loss and/or damage. Without prejudice to these Terms and Conditions, Bangkok Airways shall not be responsible for any consequences including but not limited to loss of life, injury to person and/or damage to property arising from or in connection with the Accommodation voucher winners and/or or use of the Prizes. Unless otherwise stated above, other Terms & Conditions of FlyerBonus apply.